Ever since I met my husband, the holidays just wouldn't be the holidays without a cheese ball and now in my case a gluten free goat's milk cheese ball due to my allergies. He grew up in a very small town where the high school basketball coach is famous for his holiday cheese ball. For him it has been part of every Christmas celebration since he can remember. Tonight as we gather to celebrate Christmas Eve his Mother will have the traditional version of this cheese ball for the rest of the family, and I will have my new and improved version which is safe for me to indulge in. While this cheese ball is not truly dairy free it is free of cow's milk dairy as it is made solely with goat's milk dairy. I flavored this cheese ball with some of my traditional cheese ball favorites including black olives and bacon. It is wonderful spread on gluten free crackers, corn tortilla chips, and so much more. 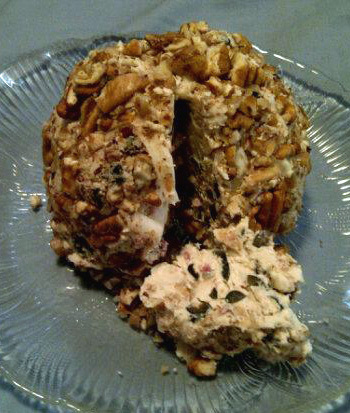 If you would like to try a truly dairy free version of this delicious cheese ball simply substitute the goat's milk products with dairy free options. I would suggest using 4 oz of dairy free cream cheese, 2 oz dairy free sour cream and a cup of shredded dairy free cheddar cheese such as Diaya Brand. Bring the Chevre (or dairy free cream cheese & dairy free sour cream) to room temperature. Stir in the onion soup and dip mix. Fold in the bacon and black olives. Roll in the chopped pecans. Chill before serving with gluten free crackers. MMMMMM,..;these goat's cheese balls look so appetizing but I will make them with sheep's cheese! Thanks! I hope you celebrated a lovely Christmas with your family, dear Stephanie! I hope you enjoy it with Sheep's milk cheese, Sophie. I don't tolerate sheep's milk products.